We recently presented the winner, Ron F. of DuBois, PA, with his brand new 2018 Ford Escape! Ron purchased the winning ticket from our DuBois Eat’n Park. 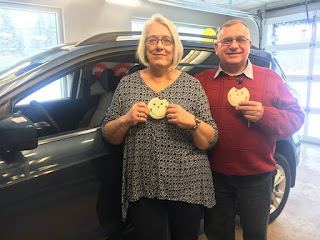 Pictured above: Ron (Our Car Raffle Winner) and his wife, Linda. We'd like to thank our friends at Neighborhood Ford Store for graciously donating a vehicle for this raffle. Our car raffle generated over $90,000 for our Caring for Kids campaign, which benefits local children's hospitals throughout our footprint! Enjoy your new ride, Ron!